A little late on posting this one. I actually finished this book almost a week ago, and I started writing this review around the same time. I don’t know why I’ve had such a block when it comes to finishing it though. 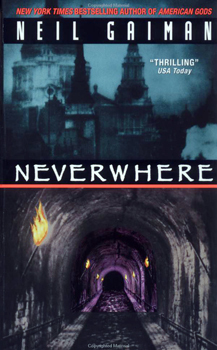 So, Neverwhere, Neil Gaiman’s 1996 story of the events that take place in “London Below.” Apparently, this was a companion piece to a television series of the same name, released by the BBC. I’ve never seen it, obviously, since I didn’t even know it existed until about 5 minutes ago when I saw the DVDs on Amazon.com. This is the story of Richard Mayhew, a rather unassuming young man who leaves his home in Scotland to move to jolly old Londontown to seek his fortune. He finds a job he doesn’t like all that much and a girlfriend who doesn’t really like him all that much. Otherwise, his is a life less extraordinary. Until the day he stumbles (literally) upon a mysterious young woman named Door, badly injured and in need of help. Ever hear the saying “No good deed goes unpunished”? Richard learns the true extent of this phrase after he takes Door back to his apartment and tends to her injuries. See, she’s from London Below, a strange realm that exists beneath London as we know it. Most of the time, those from this realm can pass among the people of London Above without being noticed. The fact that Richard can see Door is a blessing to her, but definitely a curse to him. Suddenly, he begins to attract more and more attention from residents of London Below, including a pair of the creepiest assassins in the history of creepy. Even worse, his existence in London Above becomes increasingly tenuous. His girlfriend has forgotten him, his job shows no records of him, his friends don’t even acknowledge him. What to do? Go Below. Help Door discover who killed her family and why, dodge the assassins Croup and Vandemar, get drunk with an angel, flirt with Hunter, and maybe just maybe figure out how to get back to the life he once knew in London Above. This is where Gaiman truly shines, creating a fantastical world of sights, sounds, and extraordinary characters. The journey our heroes must travel is rather Ozian by way of Edward Gorey, and the richness of Gaiman’s world is both thorough and stunning. All that aside, there was something about the story itself that never really reeled me in. I never felt enraptured. It’s not that I didn’t enjoy the story. There are elements to this tale that I absolutely loved. Holistically, however, I felt that it was a pretty run-of-the-mill tale embedded into another of Gaiman’s wonderfully imagined worlds.